Abu Dhabi: A traffic accident took a turn for the worst after the motorist responsible for the collision threw himself into the sea. Police in Abu Dhabi said the traffic accident took place a few weeks ago when two vehicles crashed into each other. One of the motorists, an Asian man, then jumped out of his vehicle and in a state of shock, then jumped over the barriers and into the sea. A unit of traffic patrols were immediately dispatched to the accident scene, and were informed about the panic-stricken motorist who was attempting to drown in the sea. “Instantly, senior assistant Rashid Salem Al Shehhi rushed to the barriers and jumped into the water to rescue the driver. Al Shehhi was also in danger of drowning several times as the driver strongly resisted,” said police. The police officer managed to eventually rescue the driver, who remained in a coma for ten days. According to police, Al Shehhi had to receive medical attention due to the physical exertion of the rescue operation. 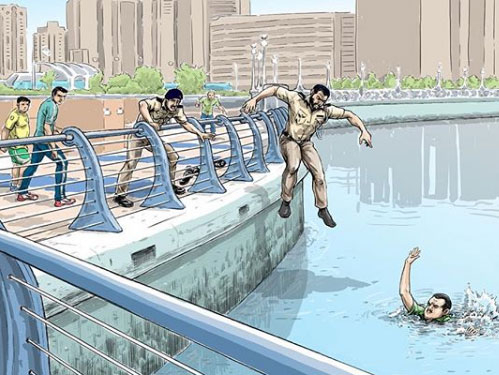 Abu Dhabi Police praised the heroic acts of officer Al Shehhi, who represents an honourable example of bravery and duty to those in need, which reflects the vision of police and its humanitarian role in saving and preserving life and property. Al Shehhi expressed pride in fulfilling his humanitarian duty as a police officer, and emphasised that an officer’s role is to assist those in need and to respond in cases of emergencies. He pointed out a police officer should never abandon his role when needed, and should provide assistance in all kind of circumstances, especially when the matter relates to saving lives.